ReBlog: How Do We Teach Creation Care to Combat Environmental Poverty? For today’s Compassion Wednesday, I wanted to simply reblog a really wonderful article that is posted over on Compassion International’s website. However, I’m having issues with sharing it, so I’m just going to give the link below and you can run over there as quick as you can to read it. It’s a great look into what Compassion does – one of the many things it does. Sometimes when people think of Compassion, they think the organization is just another child sponsorship program. Where does your money go? What do they do with these children? How does it impact their communities? 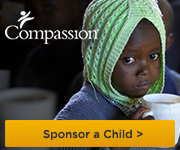 I’ve said it before, but I’ll continue to say it, this is not another child sponsorship program. It is a World Changing Organization. One child at a time, one community at a time. Sustainable change that values the community, the child, and you. Please, run over there and take a look. This sounds like a wonderful organization! Creation Care is so important because God did make us stewards of the earth. I found the article very inspiring. Thank you for reblogging it. Have a lovely day. I’m glad you liked it. Compassion really is a great organization and accountable to what they say they do. Great seeing an organizations like this to lighten the load one child at a time. I think it’s a blessing to know there are those who care enough to do it the right way! I agree. It’s good to know that true positive change is happening in the world. And it’s nice to know how I can help make an impact.